This module can help you automate counting your dice values, for example when playing games that involve throwing multiple dice. The code implemented by this module is a modified version of original code (mentioned in the above post) contributed by Yohann Payet. This module is the result of JeVois tutorial A JeVois dice counting module in C++. Also see JeVois python tutorial: A dice counting module for a Python version. where n is the total number of pips detected. No message is sent if n is zero. Definition at line 65 of file DiceCounter.C. Definition at line 69 of file DiceCounter.C. Definition at line 82 of file DiceCounter.C. Definition at line 85 of file DiceCounter.C. 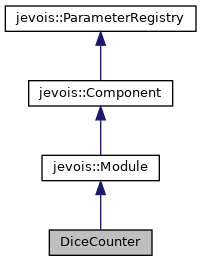 References jevois::rawimage::convertToCvGray(), jevois::rawimage::drawCircle(), jevois::RawImage::fmt, jevois::RawImage::height, JEVOIS_REGISTER_MODULE(), jevois::rawimage::paste(), jevois::RawImage::require(), jevois::Module::sendSerial(), jevois::Timer::start(), jevois::Timer::stop(), to_string(), jevois::RawImage::width, and jevois::rawimage::writeText().